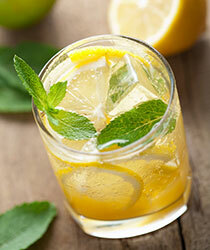 Place the lemon juice, stevia and water in a 2 quart glass jar. Stir briefly to mix the water and stevia. Cover and refrigerate. Adjust the amount of lemon juice and stevia as desired. To serve over ice, reduce the water to 6 cups.